After a beautifully clear day, and with the successes of the night before still fresh in our minds, Jonathan headed out to the observatory for sundown hoping to get an early start on some more work getting all the equipment set up. Unfortunately the weather seemed to have other plans, and in not long at all, the sky was covered in cloud. So after it started to look pretty hopeless, he closed up again and headed off. 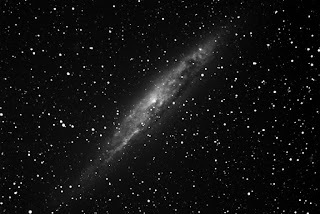 After being busy with other things earlier in the evening, I became free at around 10pm and seeing the skies reasonably clear at home in Swanson, headed out - expecting Jonathan to perhaps still be around. He wasn't of course after closing up earlier - but with only a few clouds on the horizon, I set about a few tasks. Whilst polar alignment still needs some refinement, I was also keen to get the autoguiding working again. Even though we have guider relays on the ST-10XME camera,we are using "DirectGuide" (the SoftwareBisque implementation of pulse guiding) which is more accurate and required less cables. Since we're using Maxim DL for the imaging, then Maxim needs to control the mount - this is done via TheSkyX's ASCOM driver. This provides ASCOM with what looks like a telescope mount, with multiple autoguider options - including DirectGuide. This was quickly set up and moving the manual controls in Maxim confirmed that the guider inputs weew working as expected. 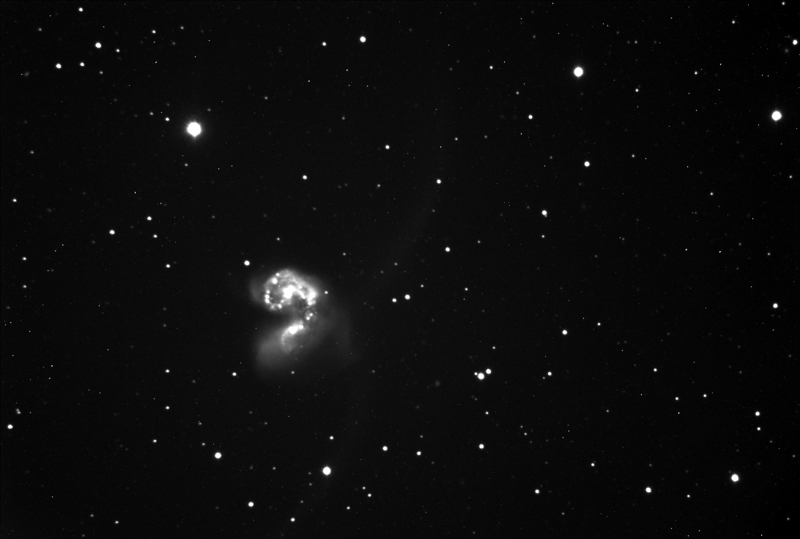 The guider calibrated correctly and seemed to be working, so I did a quick focus run and set up a short run of 120 second images of the NGC4038/NGC4039 Antennae galaxies (just in luminance) . I did forget to turn temperature compensation back on though so my focus drifted a little between the images. Whilst the image run was going on, I tool the opportunity to configure the PCs (the one in the dome and the one in the bunkroom) to be able to talk to each other - since we still have no internet connection at this point (we're working on that) - it was just a simple matter of assigning a fixed internal IP address on each machine. This allowed us to use Remote Desktop to control the dome computer from the relative warmth and light of the bunkroom. Jonathan arrived from being clouded out at an attempt at some photography further north to find that Kumeu was now perfectly clear. Jonathan continued imaging for a while taking a (much better!!) 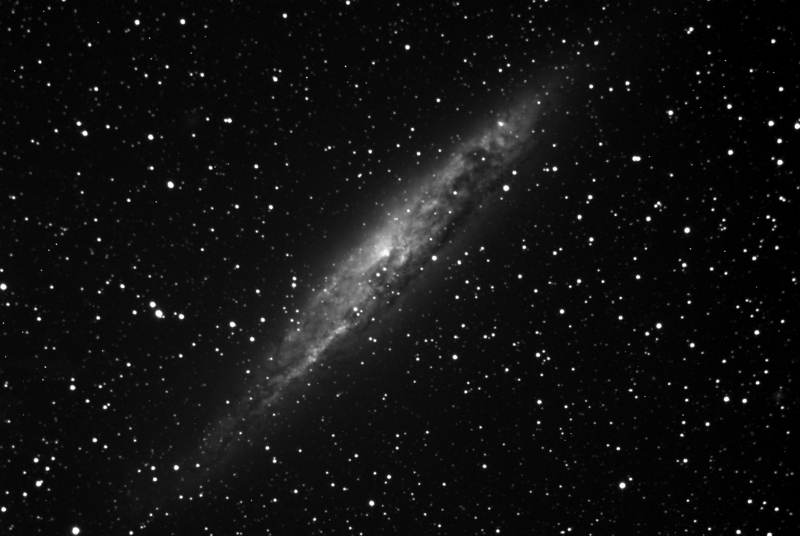 set of images of NGC4945 - he of course noticed the focuser issue and came out with a very nice image! Overall I'm really pleased with our progress this week getting things back into an operational state. The polar alignment needs more work - though with Autoguiding working now we can still image whilst we refine that fully. We have identified we need to work on collimation - so getting CCDInspector up and running for that is on the list. The next big job is slaving the dome - we had some issues with the sensor wheel slipping resulting in us getting inconsistent counts. This caused problems that the dome and the scope did not stay synced after a short run - we need to revisit this - perhaps install a rubber o ring or band "tyre" on the wheel - which may need a groove for it to sit in.